SAP has introduced a new mobile app for small and midsize enterprises (SMEs) as well as subsidiaries of large enterprises. 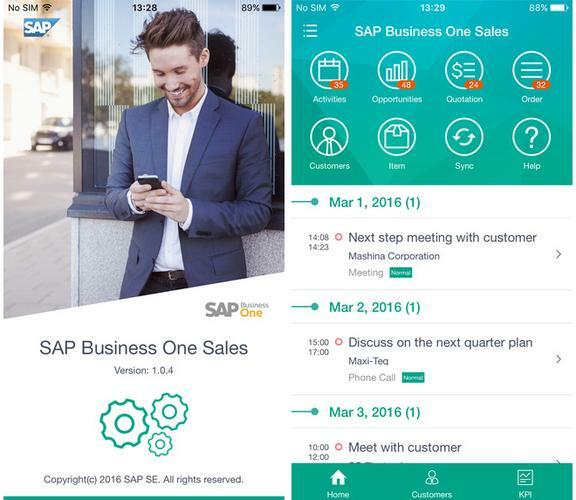 The SAP Business One Sales mobile app for the SAP Business One application, works with and is powered by SAP HANA platform. It was introduced SAP Business One Innovation Summit, being held in Orlando, Florida. A trial version of the new app can be downloaded from the Apple App Store. Development was based on SAP HANA and includes features such as pipeline management, inventory review, price quotation and order placement. By leveraging the SAP HANA platform the app can be accessed online, giving users 24×7 access to live, mission-critical data. The company said, in a statement, the announcement confirmed SAP’s commitment to the more than 50,000 existing customers of SAP Business One by providing them with an additional tool to succeed and grow in the digital economy. Enhancements include the ability to track activity and results and to forecast results from mobile devices, something that previously would have required a desktop computer. Enhanced with optimised user experience through improved visualisation, the mobile app enables on-the-go sales professionals to remain connected anywhere, anytime. “Enterprise resource planning and e-commerce are two of the top five fastest-growing mobile apps utilised by successful SMEs to streamline their sales processes, allowing professionals to spend more time engaging with customers,” said Chris Chute, IDC vice-president, SMB Cloud and mobility. The mobile app is suited for use in the 26 vertical industries that SAP software supports, including retail, consumer products, wholesale distribution, professional services, manufacturing and high tech. Read more ​Who’s winning the battle for tablet supremacy in Australia?